There are several health conditions that cause a striking number of preventable deaths in hospitals in the United States. The most prevalent among them is pulmonary embolism (PE), a blockage in the artery of the lung. Pulmonary embolisms are typically caused by a blood clot that travels to the lung from a large vein in the leg, a condition called deep vein thrombosis (DVT). According to the U.S. Centers for Disease Control and Prevention, up to 900,000 Americans may be affected by DVT and PE every year. It is estimated that between 60,000 and 100,000 of these patients die from pulmonary embolisms. About 25 percent of people with PE will die suddenly. Due to the potentially life-threatening nature of pulmonary embolism, doctors and medical professionals must recognize risk factors and signs of DVT/PE and take immediate action to prevent complications. Failure to do so can spell deadly consequences. At Fronzuto Law Group, our team of seasoned medical malpractice lawyers represent victims of physician and hospital negligence in Hackensack, Jersey City, Paterson, Morristown, New Brunswick, and across New Jersey. With over 75 years of combined experience and a law firm concentrated on medical malpractice, we have the knowledge and resources to take on the most complex and challenging medical negligence cases. Our firm’s founder, Ernest P. Fronzuto, is a highly respected New Jersey Supreme Court Civil Trial Attorney who also consults on pediatric malpractice cases on a national scale. Our commitment is to provide compassion and aggressive advocacy for every client, walking you through the legal process while pursuing maximum compensation for you and your family. If medical professionals failed to provide proper care for a pulmonary embolism and you or someone you love suffered harm, our lawyers are prepared to fight for you. Simply contact our North Jersey offices today at 973.435.4551 to receive a cost-free consultation. The answers you need are just a phone call away. Blood clots can develop anywhere; an embolus is a blood clot that develops in one part of the body and travels to another part of the body through the bloodstream. Blood clots can become lodged in other arteries, creating a partial or complete blockage. If a blood clot becomes lodged in the brain, it can cause a stroke, while a blood clot that blocks an artery in the heart can cause a heart attack. 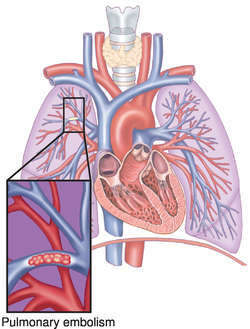 A pulmonary embolism occurs when a blood clot becomes lodged in the lungs. The majority of pulmonary embolisms begin with a blood clot in one of the large arteries in the legs, known as deep vein thrombosis (DVT). The danger of pulmonary embolisms is that they can occur suddenly and rapidly turn fatal. If pulmonary embolism does not lead to death, it can cause permanent disability, organ damage, pulmonary hypertension, and low levels of oxygen in the blood. Identifying a patient at increased risk and testing for the presence of a blood clot can allow for effective treatment and prevention of pulmonary embolism. Typically, when a patient is diagnosed with DVT or blood clots, physicians prescribe anticoagulants (blood thinners), which stop blood clots from growing and prevent future blood clots from developing. When the signs of pulmonary embolism are detected and PE is diagnosed, medical professionals must take appropriate measures to prevent severe complications. Most often, pulmonary embolism is treated in a hospital or emergency room with thrombolytics (medicines that rapidly dissolve blood clots), a catheter to remove the blood clot or deliver on-site medicine to dissolve it, or emergency surgery to remove the blood clot. If you or someone you love suffered harm or death as a result of misdiagnosed, delayed diagnosis, or failure to diagnose a pulmonary embolism in New Jersey, the highly experienced medical malpractice attorneys at Fronzuto Law Group can help. Contact our offices today at 973.435.4551. or submit a contact form online to schedule a free initial consultation about your case.